Feeling better both physically and mentally. Physically, I got a nasty cold that came with a low grade fever. Although not high, it had me down for the count. I slept for about 32 hours with minor breaks for short walks with Jack, making easy chicken soup (took a nap in between steps), eating a bowl of that and taking lots of meds. After that I felt infinitely better. I still have a stuffy nose, but I feel ok.
Mentally I feel better, too. I made progress on a few fronts and they all feel good. 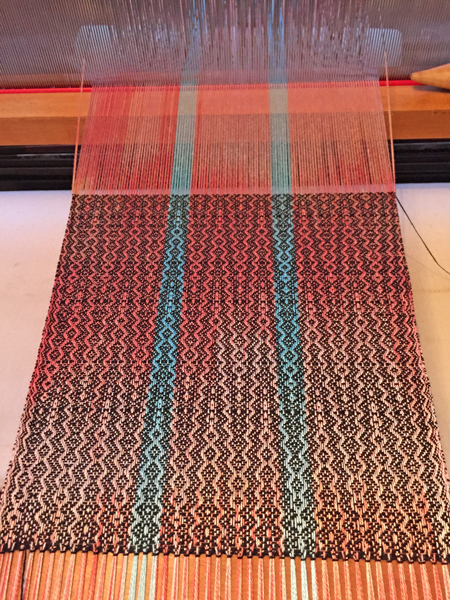 First, I beamed and wove that living coral & turquoise scarf – the second batch of dyeing I’d done in these colors. I wove the first piece with black weft and an advancing twill treadling. At that point I honestly couldn’t remember how much length I had left on the loom, or find my paperwork that told me what I had planned for. I knew there would be at least one short cowl and one something else, but since I didn’t know what the ‘something else’ was, it was most sensible to weave the short cowl first. I picked a sienna tencel and a single straight treadling that would create zig zags. I like the look. 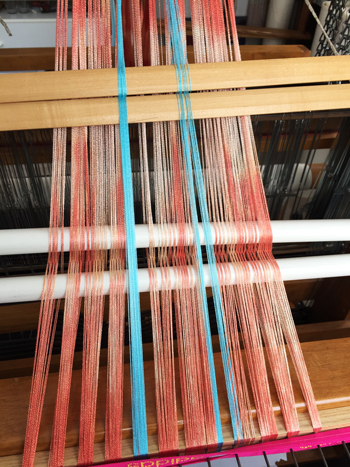 I decidedly do not like the treadling error that’s so obvious in the photo but which I didn’t see on the loom. Sigh. It will be close to, if not part of, the hemming of the cowl, so probably won’t show. I hope there are no other errors! 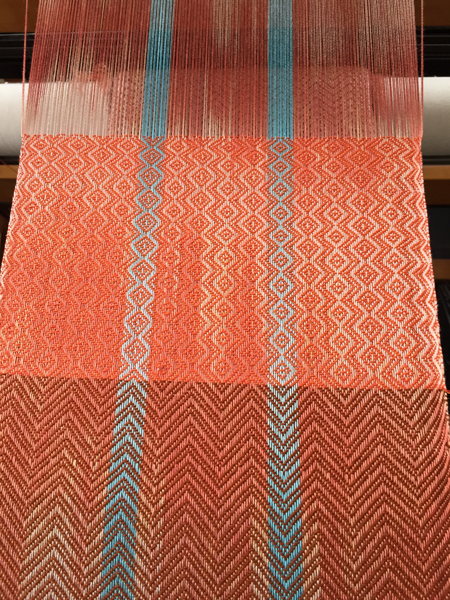 For the ‘something else’ I picked an orange weft I created by using 1 strand of 16/2 bright orange and 1 strand of 20/2 medium orange, both mercerized cotton. I used a simple dance ‘up and down the treadles’ for this one. I used some stripes of gold with metallic cotton for interspersed stripes. It might be my favorite. Once all 3 pieces were off the loom, they sat for a bit before I got to doing a some necessary needle weaving (an error in tie up for the first third of the first scarf – UGH!!) and then fringe twisting, so I can’t show them to you yet. While they were waiting for my attention I did something just for me. Sarah Swett, a woman with crazy talents for tapestry, spinning, weaving, painting, and more, posted directions for a skirt made of a combination of weaving and knitting. I’d seen her blog posts where she showed the ones she’d made herself months ago and really admired them, so when she posted a PDF with directions, I was on it! A friend wanted to join me in this adventure, and I was so excited I set to planning immediately. After a few false starts, I settled on a cotton warp (10/2 cotton, 1 strand light gray, 1 strand bright turquoise) sett at 24 ends per inch. 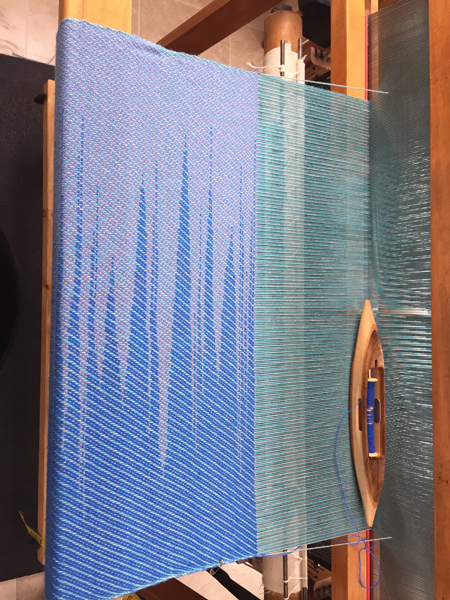 For weft I used an alpaca-silk blend in periwinkle and a mystery fiber in a bright-ish blue, woven in clasped weft. I purposely showed you the photo in this orientation because the width of the weaving will be the length of the skirt. I can’t wait to take the next steps on this project! I was feeling guilty doing something just for myself as I was struggling with whether or not I could weave enough to do both of my desired summer shows. Then I had an AHA moment! The first show, at Chautauqua Institution, required very high class items – my handwoven scarves, shawls, and now garments. The second show, in an artsy section of Buffalo, will be open to other options. I believe that as long as I jury in with the range of work, I can bring both some of my handwoven items and some pieces I’d dyed but not woven. 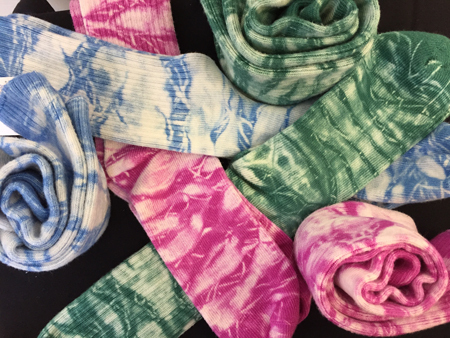 For example my shibori-dyed socks. And some ice-dyed scarves or similar. I even think a photo I took this winter will work for the jury shot of my dyeing. Dyeing clothing someone else made is SO much quicker than weaving, and I think it will fit for the second show. That decision made me feel infinitely better mentally. So now I need to finish the 3 coral & turquoise scarves, work on the next step for the skirt, re-plan the project for that first coral & turquoise yarn I dyed and get it on the loom. And keep moving forward. So glad you are on the mend! That scarf is looking lovely, so southwest to my eye and I’m betting the colors are complimentary for a multitude of people!